One of the most needed features for an image source control is a warning, if a source is missing. We included warnings for missing image sources on several pages, but also let you choose what to be set on the admin panel. With the help of this improvement, you minimize the chance of getting problems due to a missing image source. Unfortunately, due to the new media library of WordPress, this is not possible on all pages. We fixed a logic error when now displaying the name of the uploader of an image instead of the author of the post, in which the image was used. Until now, an image could have multiple sources, what is of course not possible. Another nice and requested feature is to show the image source close to the image. I decided to position it as some kind of layer above the image. 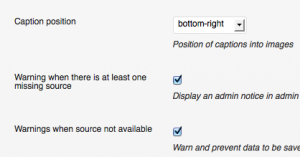 You can even choose the exact position on the admin panel. Well, the image source is not always pretty. So I included a possibility to hide it by default. You can now open the image list of a post by clicking on the image list headline. Anyway, please be aware, that in some countries with a strict copyright policy, this might cause you legal problems. If you are not sure how to handle this then always keep image sources visible.